Virginia Naturally Schools is the official environmental education school recognition program of the Commonwealth, administered by the Department of Game and Inland Fisheries with support from the Department of Education, Department of Environmental Quality and other resource agencies. 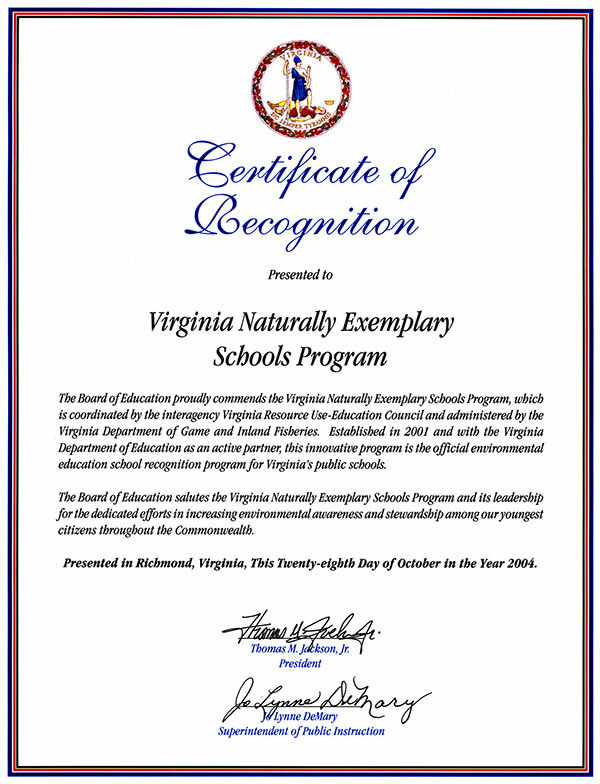 The Virginia Board of Education has recognized the Virginia Naturally School program as the official environmental education school recognition program for the state. This program recognizes the wonderful efforts of many Virginia schools to increase the environmental awareness and stewardship of our youngest citizens. If your school has already been working with its community, resource agencies and businesses to include education about the environment in the curriculum then read on and apply for the Virginia Naturally School Recognition Award. This is not a one-time award but one upon which you may build and achieve additional recognitions each year you participate. To recognize those exemplary efforts undertaken by Virginia schools to increase the environmental awareness and stewardship of its students. First year schools meeting the minimum requirements will receive a Virginia Naturally plaque. Schools maintaining and continuing their efforts in upcoming years will receive a pennant featuring one of Virginia’s state symbols to hang in the school. A different pennant will be available for each additional year the school participates. In addition to the annual pennant, schools will be able to choose from a list of workshops that will help continue their effort. Applications are available in PDF. You must have Adobe Reader or Acrobat installed on your computer to print these applications.